Once upon a time the church was the great meeting place, where the Scriptures were read to allow us to ponder the error of our ways and prepare to go forth and be better mortals. But now the church is fighting against dwindling attendances with the clergy stressing the need to become more socially relevant to start packing the pews again. This is all in vain; there is a new god and this Big Brother has a new house, usually on the edge of town... called a supermarket. Religion is now Zen and the art of supermarket etiquette. 1. In the beginning was the high street and the little shops then Big Brother moved across the face of consumerism and said “I will change man's shopping habits” and lo, his habits were changed. 2. And Big Brother said “I will give you much more for much less and I shall build big car parks for you to venture into and I shall provide an abundance of trolleys and baskets.” And so it was done. 3. But hidden within this benevolence, and stacked between the brocolli and designer beers, Big Brother exacted a mighty price from his subjects. 5. And so it was written and Big Brother laid down his commandments. 6. Come ye to my doors for the hours which they are open are long and many and my parking spaces are many, though not as many as you need when you needest them. When it overfloweth, thou shalt queue and be merry. 7. 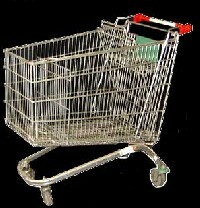 Taketh a basket or a trolley; oft I will make thee insert £1 to unlock your trolley and you shall not grumble if you have not the coin but you will queue for change and be merry. 8. Oft I will provide a servant to hand thee a basket and when she talketh to a neighbour about how her friend Ella is, thou shalt wait, queue and be merry. 9. And once inside my portals thou shalt find I have rearranged my shelves. Thou shalt not quibble but wander bewildered within me and be merry. 10. There shall be no rules or path for travelling within me. Thy feet will be crushed, thy legs bruised, thy children run over, and many aisle-jams you shall endure as neighbours discuss the well-being of Ella, but thou shalt not grumble. Thou shalt be merry. 11. And when thou has completed thy shopping duty you shall come and stand before me. Thou shalt queue and be merry. 12. And when you standeth in my queues for 10 items or less, thou shalt not counteth what lies within thy neighbour's basket. Thou shalt queue and be merry. 13. And when thy neighbour before thee exclaimeth: “I think have the 33-odd pence,” thou shalt not wail or gnash thine teeth when she hath only 32 then enquirith if a 50p will do then announceth she hath not a 50p either. Thou shalt queue and be merry. 14. And when thy neighbour before thee be an acquaintance of one of my servants thou shalt not wail or gnash thy teeth at any enquiries over Ella or where she went for her holidays. Thou shalt not squeeze thine money and make it sweaty, shuffle your feet or maketh exasperated noises. Thou shalt eavesdrop, for it is expected. but thou shalt wait, queue and be merry. 15. And when you finally stand before me thou shalt honour the barcode, for the barcode is order and truth. Though in every basket and in every trolley thou shalt carry the burden of an item with an unrecognisable barcode, you shall not wail. Thou shalt wait for thine barcode to be checked and thou shalt queue and be merry. 16. And once all is accounted for and thine debts paid, thou shalt accept my discount card whether thou needest or requireth it. For it is good. 17. Then thou shalt go forth with thy messages and loadeth thy vehicle and depart. And thou shalt be thankful for all the goodies contained within and thou must pledge forever to queue and be merry. For that is the way and the way is good for I decree it.